The Backyard Boys is a boyband consisting of the members R.J., Dermott, Cody B., Ryinne, and Sluggo. 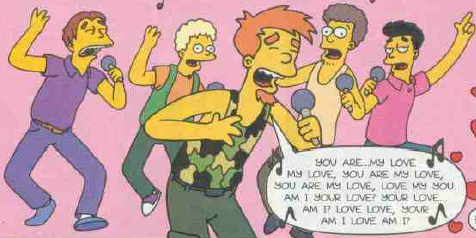 One of their hit songs is "You Are My Love". The band is a boyband and a date with the band was the first prize in a contest at "Cool Kid Magazine" which Lisa won. She also won a date with the boy band N'Style and both were held at 3:00 on June 13. She thought just minutes before they arrived that when both bands found out that Lisa won a date with two boybands they would begin to fight to show her who she would go out with, but when they arrived they actually started duetting. When the singing duet was a draw Homer forced them to paint the house. Lisa decided after a while to go with only one member, who can answer the question "What's the name of the famous abolitionist and women's rights activist whose face appeared on an unpopular U.S. Coin". As no one could the answer she randomly chose Shades from N'Style. The band is a parody of the Backstreet Boys. Comic story – Battle of the Boy-Bands! Modified on March 12, 2019, at 12:42.